The Causes of Inflation There are three major causes of inflation: 1. 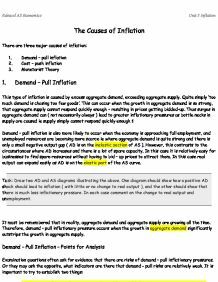 Demand - pull inflation 2. Cost - push inflation 3. Monetarist Theory 1. 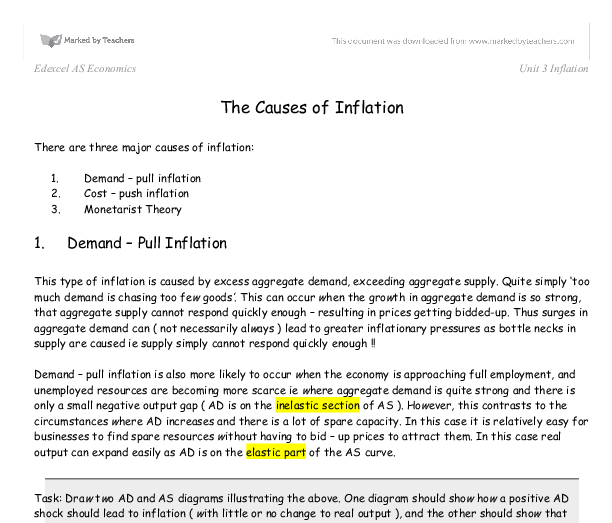 Demand - Pull Inflation This type of inflation is caused by excess aggregate demand, exceeding aggregate supply. Quite simply 'too much demand is chasing too few goods'. This can occur when the growth in aggregate demand is so strong, that aggregate supply cannot respond quickly enough - resulting in prices getting bidded-up. Thus surges in aggregate demand can ( not necessarily always ) lead to greater inflationary pressures as bottle necks in supply are caused ie supply simply cannot respond quickly enough !! Demand - pull inflation is also more likely to occur when the economy is approaching full employment, and unemployed resources are becoming more scarce ie where aggregate demand is quite strong and there is only a small negative output gap ( AD is on the inelastic section of AS ). However, this contrasts to the circumstances where AD increases and there is a lot of spare capacity. In this case it is relatively easy for businesses to find spare resources without having to bid - up prices to attract them. ...read more. How much of an negative output gap is there ? The size of the negative output gap could be signaled by: � Low levels of unemployment ( eg on the LFS measure ) � Shortages of suitably skilled workers to fill vacancies - this is often referred to as a tightening of the labour market. � Possible pressures on wage rates due to skills shortages � Difficulty in finding suitable office space / vacant buildings. � Rising rents for office space due to shortages 2. Cost - Push Inflation This type of inflation is caused by costs rising for firms - which are in turn passed on to consumers In the form of higher prices. Very importantly, this type of inflation can occur irrespective of the state of the economy. ie AD might be fairly weak, and there could even be relatively high unemployment, cost -push inflation is still possible. A good example of this would be due to oil prices rising. Task: Using an AD and AS diagram show how an increase in oil prices can lead to inflationary pressure irrespective of the strength of AD. ...read more. This in turn will lead to inflation. Monetarists believe that the money supply can grow steadily - without creatung inflationary pressure. However, if increases become too large, then the prices will get bidded-up. The Government's Inflation Target Remember the Government has given the Monetary Policy Committee at the Bank of England an inflation target of 2.5 % RPIX ( with an allowable + or - 1 % deviation ). The MPC are in control of interest rates, and manipulate these in order to reach the inflation target. Thus the MPC must often look at current data ( eg retail sales, unemployment figures, wage inflation, savings ratios, consumer borrowing etc ) to gauge future inflationary pressure. If inflationary pressures are building, interest rates will be increased. If there are reduced inflationary pressure - rates will fall. Task: 1. Explain how a rise in interest rates should help reduce inflationary pressure 2. Examine the implications for interest setting if the government lowered the inflation target to 1.5 % 3. Examine the implications for the wider economy of a reduced inflation target. 4. Identify 10 pieces of data that the MPC might want to consider when making its monthly interest rate decision. Edexcel AS Economics Unit 3 Inflation The Blackpool Sixth Form College (c) 2003 BN 20/1/03 ...read more. In China they are doing the opposite to tightening fiscal policy (know as expansionary policy), they are exercising high government spending to try and stimulate consumption. In Britain fiscal policy plays less of a major role, this is because of political stigma and monetary policy. with price rises, due to upward pressure on material and wage costs. This is as opposed to more resources available as an alternative to fuel the demand. With spare capacity, this will still take place, but to a much lesser extent as firms are confident they can compete in the market without being stretched for resources in the short run. As percentage of GDP, external debt and liabilities stood at 51.7 percent in end June 2000, declined to 43 percent in June 2003 and further to 37.8 percent by end March 2004 - a decline of almost 14 percentage points of GDP in just less than four years. In order to ameliorate this unemployment and clear the market, wages have to drop. If wages are 'sticky-downwards', this may not occur and unemployment may persist. Here, the supply of labour is greater than its demand. Unemployment from the supply-side may also occur due to occupational/geographical immobility. This will reduce the number of people trying to buy pounds, which reduces its value on the exchange rate markets. This will give the UK a more competitive edge internationally, therefore increasing the amount of exported goods. All of these things have meant that inflation will have happened in the short run. Availability of resources: If a firm wishes to expand production, it will need more resources. If the economy is already using most of its scarce resources, then firms will find it difficult to employ more, and therefore, output will not rise. Hence, supply of most goods will be inelastic.